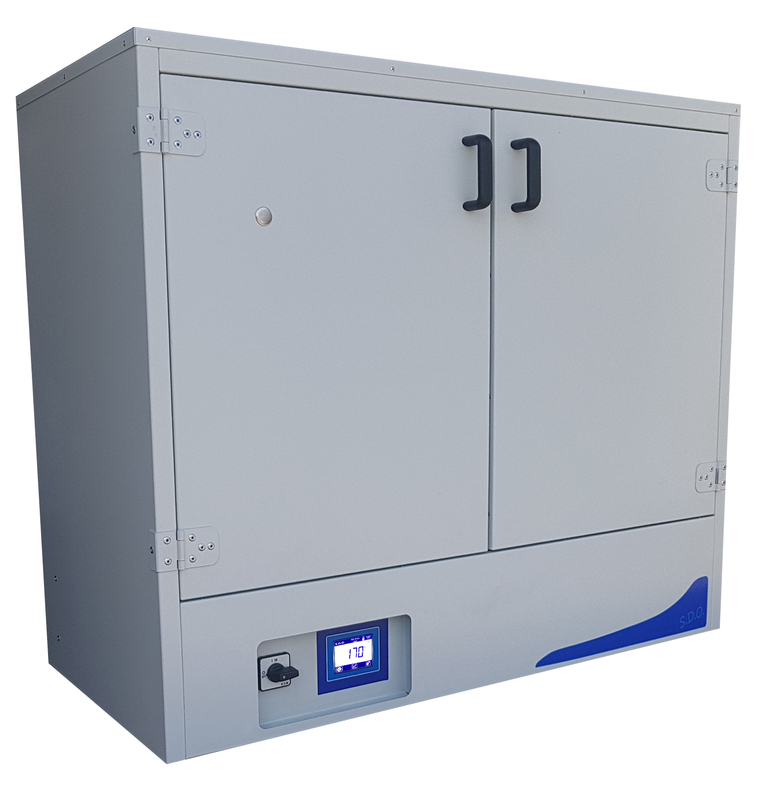 The Genlab range of Soil Drying Ovens offers a selection of highly efficient, reliable and cost effective units to suit most material testing requirements. These range of ovens are designed for drying large quantities of soils and aggregate samples and maintains temperature in accordance with BS EN and ASTM requirements. They feature our latest touch screen control system, which offers intuitive control and excellent accuracies designed for soil drying ovens.. The exterior is constructed from sheet steel finished in an easy clean powder coated paint. The interior chamber is made from mild steel coated with aluminium (CLAD). Heated by Incoloy sheathed elements positioned in the either the base or side of the unit. Fresh air is entered into the oven and passed across the heating element and into the chamber. Air is then continuously circulated around the chamber with around 15% expelled through the top vent which is replaced with the incoming air. The control system comprises of a bespoke touch screen user interface that offers both accurate temperature control and an integral overheat system by using 2 individual PT100 sensors. Advanced features can be turned on and off to suit bespoke heating applications and tailored to customer preference. Oven trending is displayed for up to 48 hours and optional upgrades are available for alarm outputs. All units have CLAD interior with 3.2in touch screen control as standard. E.g. SDO/225/TDIG with timer and access port becomes SDO/225/TDIG/TIM/AP. Contact sales for bespoke options. 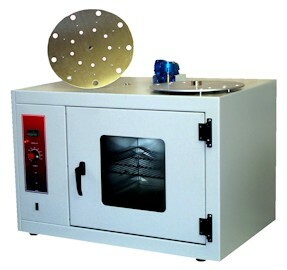 This dual purpose oven is designed to perform the loss on heat test and thin film test for bitumen and asphaltic materials and complies to the requirements of BS 2000 ASTMD6, D1754 & AASHTO T47, T179. The exterior is constructed from sheet steel finished in an easy clean powder coated paint and the interior chamber is made from stainless steel. The unit is well insulated and has a double glass door for viewing the test chamber. The control system comprises of a microprocessor digital controller and overheat thermostat with calibrated scale and tamper proof lock. Temperature is controlled and pre-set at 163C +/- 1C. Two rotating platforms of 13.5 inches diameter are supplied to perform both the tests. 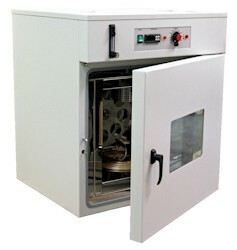 The Rolling Thin-Film Oven (RTFO) procedure provides simulated short term aged asphalt binder for physical property testing. Asphalt binder is exposed to elevated temperatures to simulate manufacturing and placement aging. The RTFO also provides a quantitative measure of the volatiles lost during the aging process. AASHTO T 240 and ASTM D2872. 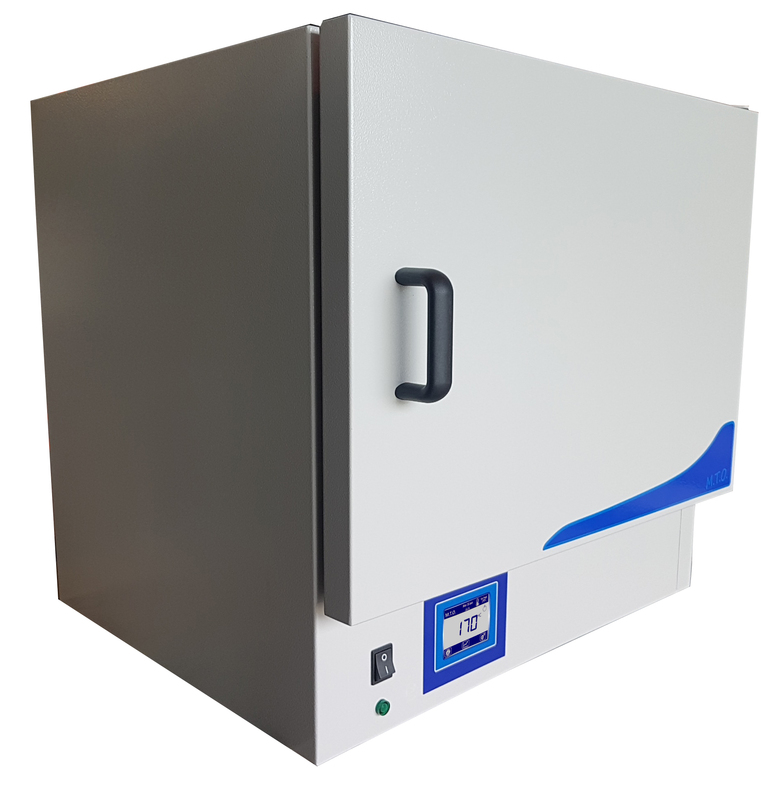 The Genlab range of Material Testing Ovens offers a selection of highly efficient, reliable and cost effective units to suit most material testing requirements. It is an ideal general purpose oven. This range is available with ‘simple to use’ thermostatic operation, or, with Genlab’s latest touch screen control system which offers intuitive control. Both control systems offer excellent accuracies designed for material testing applications. Heated by Incoloy sheathed elements positioned in the rear of the unit. Air is entered into the rear of the unit, passed across the heating element and into the chamber. Available with 2 options, thermostatic or touch screen digital interface. Thermostatic control comprises of a direct reading thermostat and overheat thermostat, both with calibrated scales and tamper proof locks. They also include a mains switch with heating and overheat lamp indicators. Touch screen option offers both accurate temperature control and an integral overheat system by using 2 individual PT100 sensors. Oven trending is displayed for up to 48 hours and oven status is shown on the 3.2 in colour screen. Advanced timer options are available in this model. All units have CLAD interior with either thermostat or touch screen interface as standard. 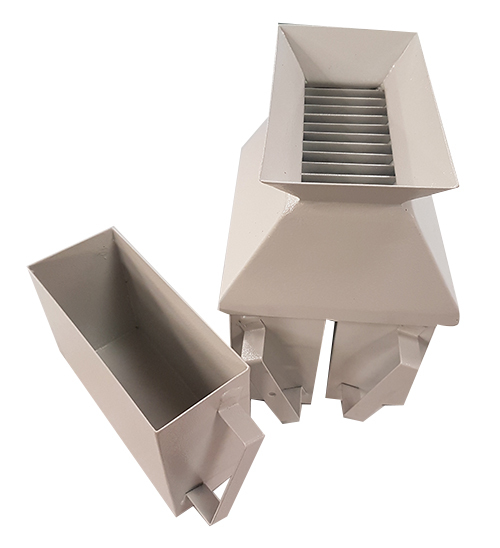 These sample dividers are constructed of heavy gauge sheet metal finished in an easy clean powder coated paint and are supplied in a range to meet the requirements of BS 1377, 1924 , 812 and ASTM C136. Each riffle is supplied complete with divider and three containers. A range of heavy duty galvanised steel nesting trays and quartering trays (one side removed). This range of ovens is designed for drying large quantities of soils and aggregate samples and maintains temperature in accordance with BS EN and ASTM requirements. The Genlab range of Material Testing Ovens offers a selection of highly efficient, reliable and cost effective units to suit most material testing requirements and is an ideal general purpose oven. Featuring our latest touch screen interface. 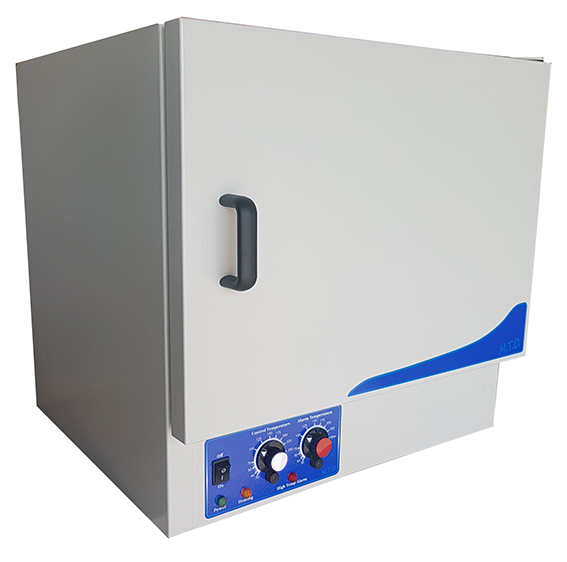 This dual purpose oven is designed to perform the loss on heat test and thin film test for bitumen and asphaltic materials. 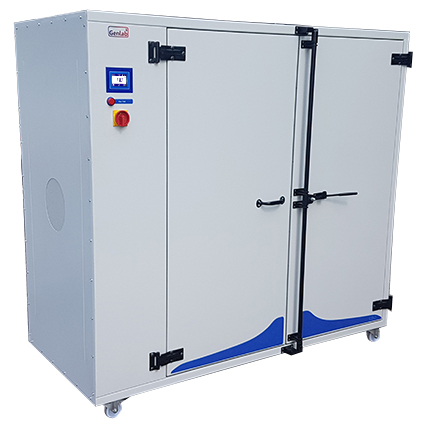 Genlab offer a range of Curing Ovens that are ideally suited for the curing of composite materials. The GENLAB range of unstirred water baths is ideal for general laboratory use and are economical, reliable and very cost effective. Genlab manufacture a comprehensive range of drying and testing ovens specialist asphalt testing ovens. The units meet the requirements of both BS and ASTM requirements. 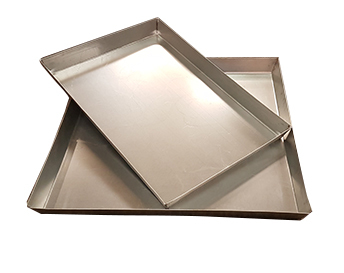 To complement our oven range we also manufacture a wide range of riffle boxes and trays. Genlab achieved ISO9001 accreditation in 1994 and all of the units are CE marked. We are able to offer a full custom build service to meet customer’s special requirements. All Genlab products are manufactured in the United Kingdom and we are the UK's leading supplier of soils and asphalt testing ovens.